Is North Korea the ticking bomb we thought it to be? 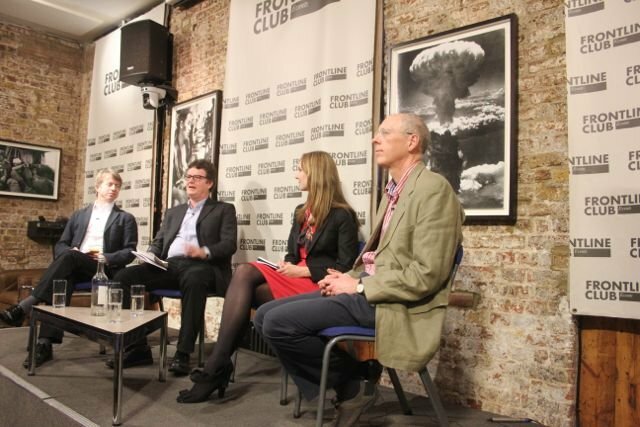 Analysts and experts treated the audience to rare accounts and informed insight into the North Korean regime’s mindset on Tuesday 15th April at the Frontline Club. BBC East Asia Editor Charles Scanlon hosted the discussion on the hot topic of North Korea’s threat – is it imminent, or is it overstated? – with former British Ambassador to North Korea John Everard, Cambridge lecturer Dr. John Swenson-Wright and Andrea Berger, a Research Fellow in Nuclear Analysis at the Royal United Services Institute. “There is an argument that we should be ignoring this country. The problem there is that if you try and put North Korea in a box and try to contain it, you give them the opportunity to engage in these efforts to proliferate and enhance its capabilities,” he added. Alex Glynn is a freelance journalist currently doing a Newspaper Journalism MA at City University.